April 9, 2015 – The Mars Society and the Mars Desert Research Station (MDRS) Mission Support Staff are calling for donations to help establish the John Barainca MDRS Memorial Scholarship, which will be used to subsidize teachers who participate as crew members in the MDRS program. 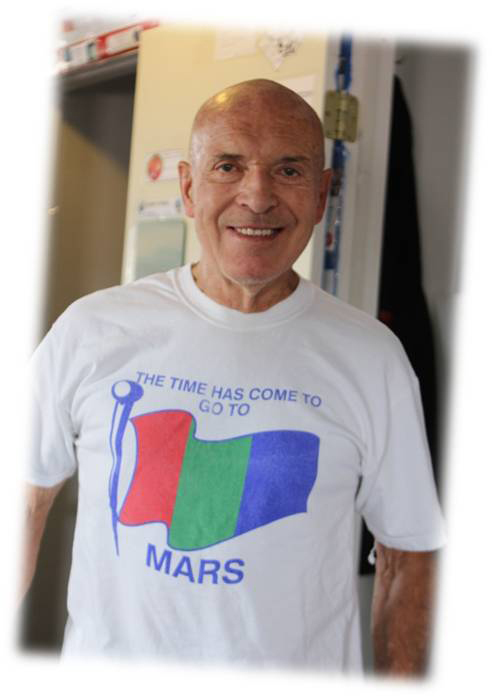 Having passed away recently, John Barainca (1935-2015) was one of the founding members of the Mars Society, headquartered in Lakewood, Colorado, and a dedicated supporter of the MDRS analog simulation. John played a key role in establishing the MDRS facility by helping select its location in Utah and working as part of the crew that built the station. In addition to his role in establishing the MDRS facility, Barainca served as long-time Hab manager, volunteering countless hours to repair and improve the station, manage its field seasons and train its crews. He also participated as part of the MDRS astronomy team. “John was a true believer in the potential of the Mars Desert Research Station to teach and inspire crew members, ranging from educators to students to scientists,” said MDRS Remote Science Team Coordinator Dr. Jean Hunter. Mars Analog Research Stations are laboratories on Earth that allow teams to experience what it will be like to live and work on another planet. Each is a prototype of a habitat that will land humans on Mars and serve as their main base for months of exploration in the harsh Martian environment. The analog environment offers an unprecedented opportunity to carry out Mars analog field research in a variety of key scientific and engineering disciplines that will help prepare humans for the exploration of that planet. The research is vitally necessary before we leave Earth. For example, it is one thing to walk around a factory test area in a new spacesuit prototype and show that a wearer can pick up a wrench – it is entirely another to subject that same suit to two months of real field work. Similarly, psychological studies of human factors issues, including isolation and habitat architecture are also only useful if the crew being studied is attempting to do real work in an isolated environment. If you’d like to honor the memory of a John Barainca and the indispensable part he played in the Mars Society and its mission, you can contribute to the John Barainca MDRS Memorial Scholarship.